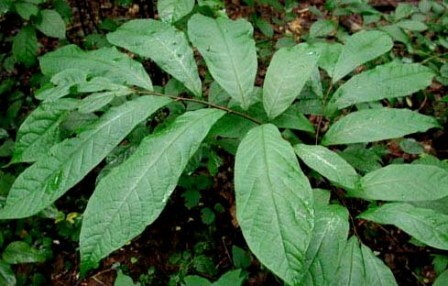 Pawpaw is native to America. It grows naturally in the the pawpaw is native to the Eastern, Southern, and Midwestern United States and adjacent southernmost Ontario, Canada, fromNew York west to southeastern Nebraska, and south to northern Florida and eastern Texas. Pawpaw fruits are collected from the wild and then sold in the market. 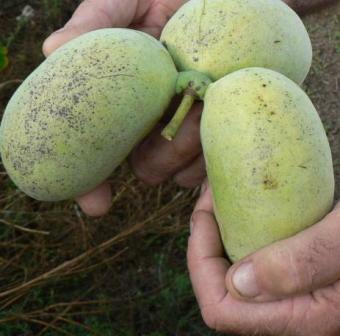 Pawpaw is one of those fruits which have a big potential as an orchard fruit. Efforts are therefore on way for its domestication as an orchard fruit. Pawpaw has now also started reaching other parts of the world. Small deciduous tree up to 13 m tall, 30 cm in diameter, often found in growing in small clusters which may comprise individuals and/or clones by root suckering of the original seedlings; twig moderately stout, red-brown; buds purplish brown, fuzzy, naked bud which is flattened and often curved, terminal bud 6- 12 mm long; bark smooth, brown, splotched with wart-like lenticels, often with light gray patches. Leaves alternate, simple, obovate to oblong, 12-25 cm long, 5 to 8 cm wide, green above and below; emit green pepper odor when crushed. 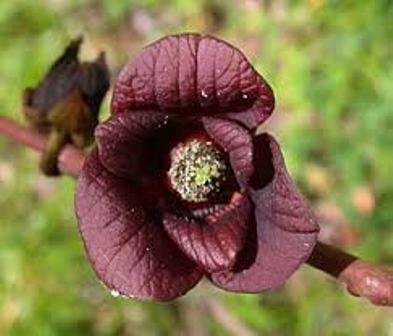 Flowers monoecious, purplish-brown, broad bell shape, 6 petals, 2.5 to 4.5 cm across; appearing with or slightly before the leaves. Fruit of unique shape in resembling a short, fat banana, 8 – 10 cm long, at first green then tuning yellowish then brown as they ripen in the fall; very fleshy and tastes much like a banana, seedlings (but not named cultivars) may have some bitterness to the flesh. 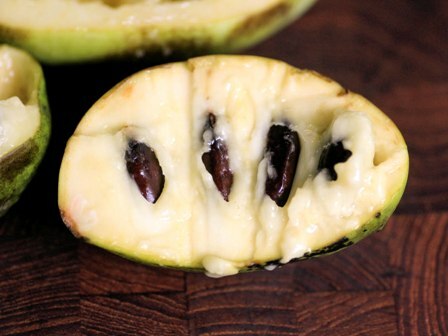 Pawpaw fruits have custard like taste and are highly nutritious too. They have a have a complex, tropical flavor unlike any other temperate zone fruit. At present, the primary use of pawpaw fruits is for fresh eating out of hand. The ripe fruit is very perishable with a shelf life of 2 or 3 days, but will keep up to 3 weeks if it is refrigerated at 40° – 45° F.
Wild collected fruits are often sold in the market. 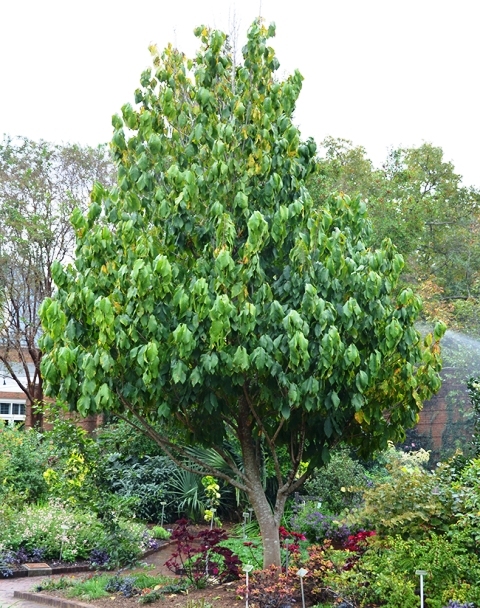 Pawpaw trees seem to prefer rich loamy soil with plenty of moisture and a sunny location in order to bear fruit. New trees are mostly raised from seed. Seeds must be promptly sown; if dried, they die. Cuttings do not root easily . Even seedlings also take 1-3 months to germinate or natural cold stratification over winter. Young seedlings require partial shade. This requirement, together with the need for sun to fruit, necessitates careful site selection or preparation. The bearing starts after 4-6 years. The trees are cold hardy upto 20 C. These are also free from any major pest or disease. The main problem with pawpaw is low fruit setting. The flowers tend protogynous and therefore do not set enough fruit. This problem can, however, be solved by hand pollination. Nurserymen offer a large number of varieties of this fruit. Experts recommend Davis, Mary Foos Johnson, Mitchel, Overleese, Prolific, Sunflower and a few others.